Michael has a very distinctive style, featuring strong use of colours, combined with light and shade. 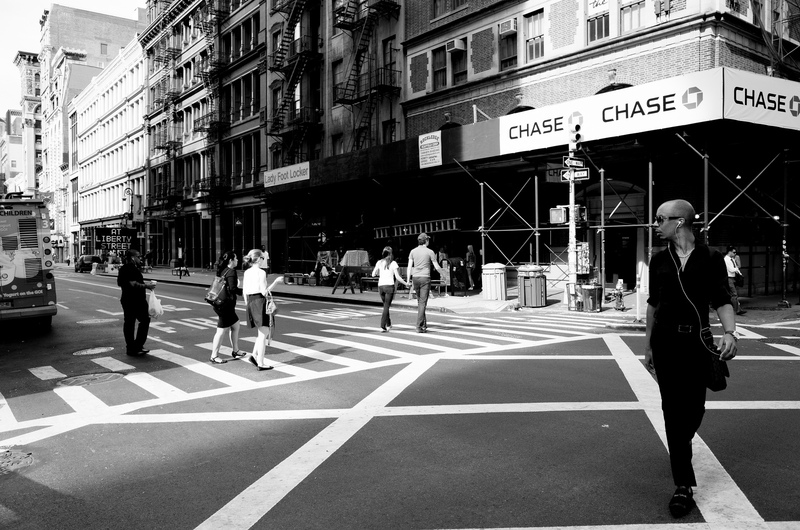 Many street photographers tend towards featuring black and white monochromatic images. Michael is the exception to the rule. His images make me want to pick up a roll of soon – to – expire Portra 400 and get out there to see the world in colour once again! What has Michael got to say about stuff? 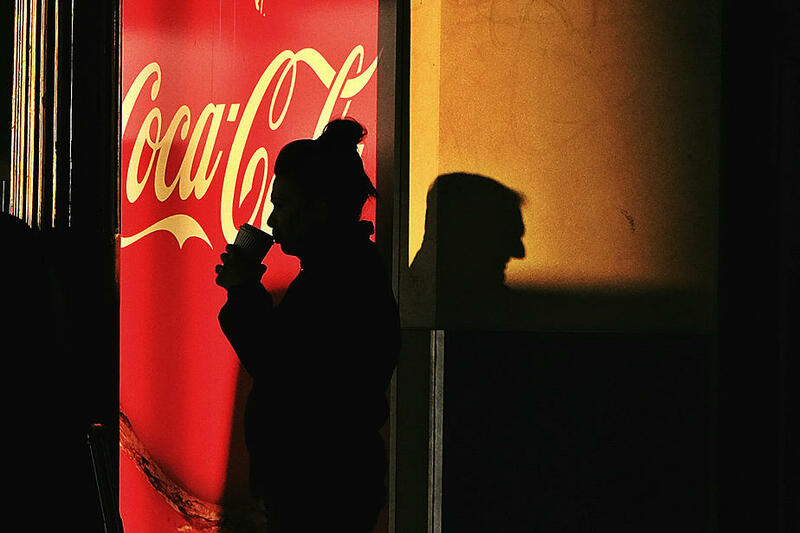 I love looking at street photos – their randomness, emotion evoking qualities, stories, colours, shades and shadows. I also love the process of making street photos. I enjoy the chase for the “keeper” photo, searching for the right moment, with the right light, with the right person with the right gesture. The editing process is just as enjoyable for me, and it’s often at that point that I realise I have a good shot. Capturing an emotive street life moment, and producing it, through my camera and editing, is what drives me most and fuels my passion. Everyday millions of moments, gestures, expressions and situations pass us by. To capture just one of those single “moments” and turn it into art, is totally addictive and what I love doing. I started taking street photos under 2 years ago, and started with a Canon 700D, but now use a FujiFilm X100T and my iPhone 6. I love the FujiFilm and use manual settings which I adapt to my most enjoyable conditions: early morning, late afternoon, colour rich environments with interesting subjects. You miss 100% of shots you don’t take. If it doubt, take the photo. A sizable percentage of photos I have ended up with the biggest emotional connections, have been random, 100% instinctual photos. The more photos you take, the better you’ll be faster. And when you do have those days where you come home with nothing, don’t sulk (well, no longer than 15 minutes of sulking), and get back out there as soon as you can. Some of my very favourite photos, I took the day or morning after a “bad day”. I have many, but anywhere where there’s colour, shade, people and good light. I love Melbourne’s CBD, St Kilda, Chapel Street, South Melbourne and Vic Market. My favourite scenario: golden hour in the CBD. I think a few years ago, I began a subconscious search for a creative outlet. My grandfather was a very prominent sculptor in Europe and my father more so in Melbourne. I had hints of my fathers’ artistic abilities, but had never pursued anything until I got the street photography bug. I was overseas taking some photos with my phone and a few turned out to capture an emotive street moment that looked good and resonated with me. Since 2014 I have spent all my spare time taking photos and enjoying researching the masters – Joel Meyerowitz, Alex Webb, Jeff Mermelstein and Saul Lieter. I also love looking at modern photographers like John Goldsmith and Michelle Rick who inspire me with their amazing work. It is often a consistent theme as street photographers develop to reduce and simplify their camera of choice. Michael’s tip and preferred tool – the X100T – ensure that he has a camera with him more often. Most people start thinking a DSLR is the right tool. Over time, the pull of something a little more portable and less obvious can become quite strong. I love my SLRs, but they are what people define as “pro” cameras. It is a little more confronting to have a big SLR poking at someone on the street vs a little point and shoot, or rangefinder. Consider your choice of camera carefully, and remain open to possibilities. The lens on the X100T is much better than most kit lenses you will get with a DSLR, and will easily fit in your bag or even a pocket. Do you really need that DSLR weighing you down? (Yeah, but I admit one of my all time favourite cameras is the Nikon F3!). As a primer, you can find out more about rangefinder cameras here. 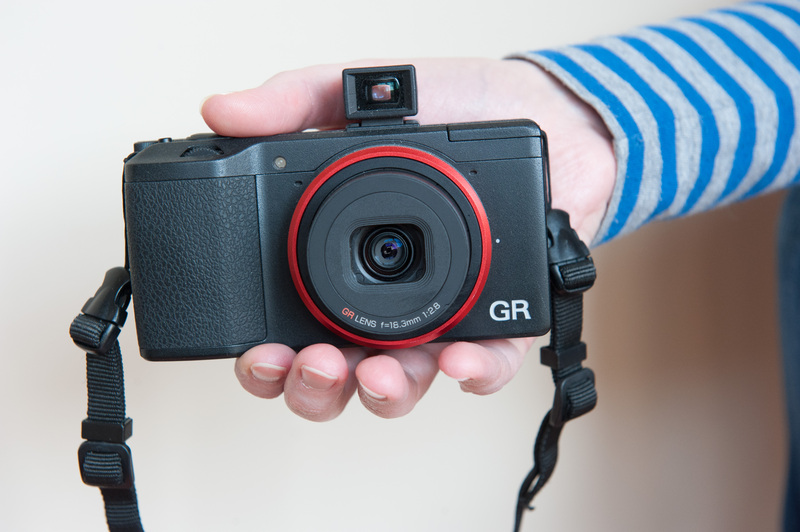 Or maybe have a think about something like a Ricoh GR Digital (what I have as an alternative to the X100T). This camera fits in my pocket. And took this image when we travelled to NYC together! This first image represents Michael’s strong visual style perfectly. Deep, rich colours, bathed in the light that floods Melbourne during the “golden hour” which he calls out. The silhouette and the shadow outline are somehow of different people. Not sure how he got this one pulled together, but it is clever in the way it challenges the viewer’s initial perception of the scene. Like a number of the images I have discovered, reviewing different local photographers, Michael has no fear of dark places in his images. Negative space created by the lack of light serve to highlight the subject and make sure the moves to the places intended by the photographer. Courage is needed to not worry too much about lighting every corner of the image. I love this image. Again, a lot of dimly lit space, which leads straight to the subject who is exiting the frame bottom right – the same place your eye is going to exit. This image is what I would imagine Garry Winogrand would shoot if he were around today. A bit gritty, a bit real, and a realistic representation of life. Not sure what camerea Michael used for this image, but I suspect it was the X100T. The 35mm focal length would have enabled him to capture the subject in the bottom right to deliver the dynamic feel of the image, but without having to point the camera directly at the subject. The small, relatively inconspicuous size of the camera, combined with a technique of keeping moving would have resulted in the shot happening in an instant without it really even registering on the subject’s radar. And finally, an instant favourite for me. This image is a great interpretation of a common subject. Public laundries seem to show people in some kind of suspended animation, just waiting for someone with a camera to come on by. 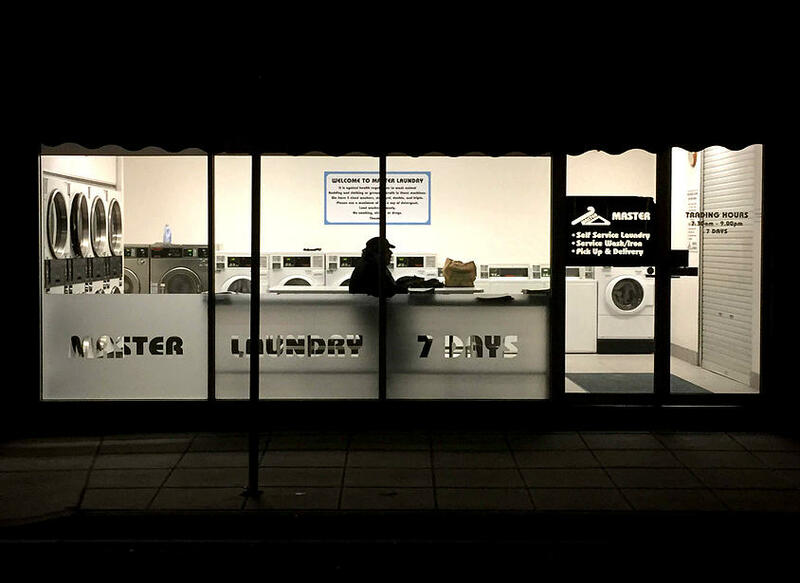 This image features exceptionally strong framing, with the dark outside of the laundry, and the window frames working together to segment the image. There is a nice feel with the tumble driers and the wall on the far right working together to balance the image. The subject is dead, smack middle, dispelling the rule of thirds mandatory. 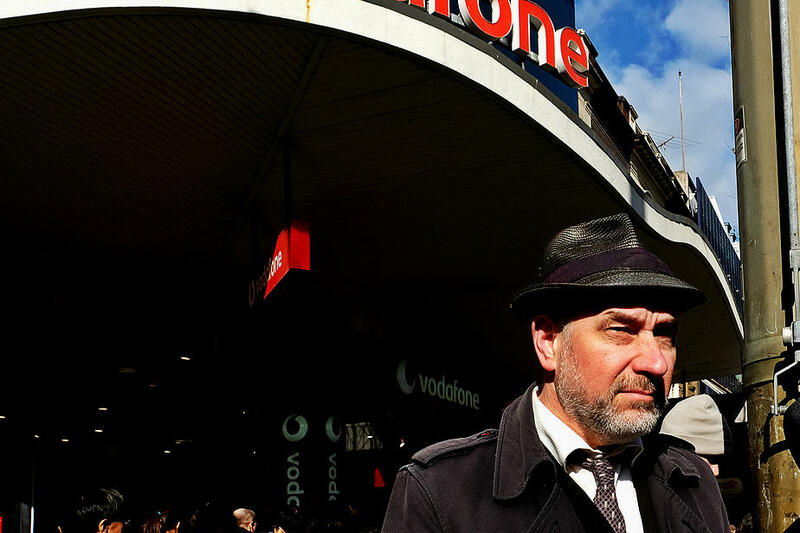 Thanks to Michael for spending some time with Melbourne Street Photography. Love your work!